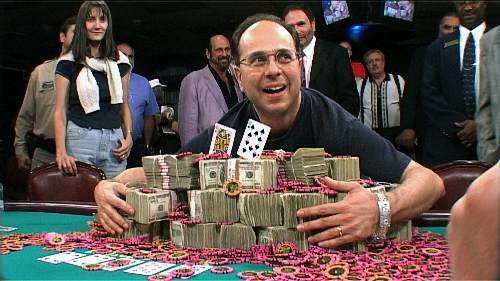 Poker Kings was shot intermittently over 13 months as Maciek (Wzselaki – director) followed 10 tournament poker players around the world as they aimed for the ultimate poker prize at the 2003 World series of Poker held at Bullions in Las Vegas. There was over 160 hour of footage plus archival to reduce down to a television hour. Of the 10 players followed 5 became the focus of the documentary. It was a protracted edit, receiving footage, watching, emailing reports and character observations to Maciek then assembling footage down to a third of what had been shot before we entered the 8 month editing period. It was the biggest documentary I worked on at the time and not knowing poker wasn’t a deterrent. I could learn the rules. Poker Kings isn’t there to tech the audience how to play No Limit Texas Hold’em. It peers behind the green felt rooms and looks at the players and their partners as each tournament played impacts on their lives. Our main struggle was moving between the 5 main characters while weaving in some of the reoccurring minor players that appeared in tournaments around Europe, Russia, the United States and Australia.